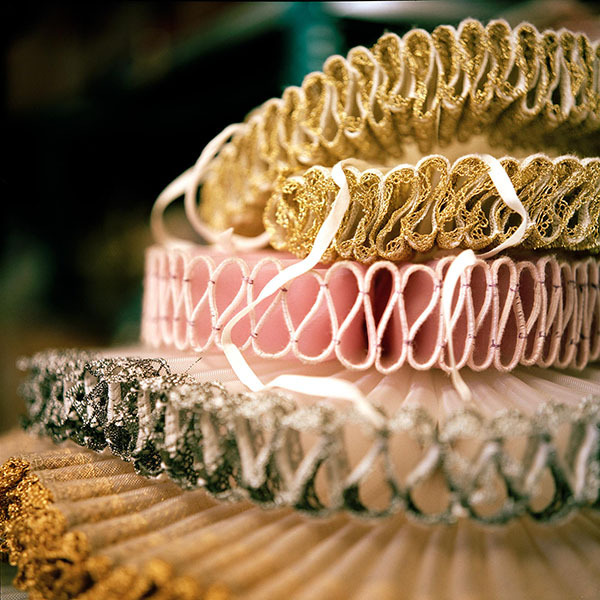 Italy Stefano Nicolao Theatre tailoring Millefeuille: Renaissance ruffles in cotton or horsehair with metal lace, from the film Elizabeth. Stefano Nicolao created Nicolao Atelier Sartoria Teatrale, a Venetian costume-tailoring workshop, in the 1980s. The period costumes created in this atelier are completely worked on by hand, and precious fabrics are sewn together using techniques and styles faithful to the original period designs. The costumes produced in the workshop are commissioned and exhibited internationally, in opera houses, theatres, ballets, cinemas and on television. Italy Riccardo Bisazza Glass mosaic tiles Soffioni: first phase of gold plating where blown glass bubbles are broken and used for the handcrafted application of the 24K gold leaf. Orsoni is a historic Venetian furnace that uses the same techniques from 1888 to produce 24K gold leaf mosaics and enamels with more than 3,000 tones and shades. While the company proudly conserves its heritage and historical knowledge, it also put a strong focus on design and innovation. In 2003, Orsoni was incorporated into the Trend Group. Orsoni is a historic Venetian furnace that uses the same techniques from 1888 to produce 24K gold leaf mosaics and enamels with more than 3,000 tones and shades. While the company proudly conserves its heritage and historical knowledge, it also puts a strong focus on design and innovation. In 2003, Orsoni was incorporated into the Trend Group. [b]Orsoni[/b] is a historic Venetian furnace that uses the same techniques from 1888 to produce 24K gold leaf mosaics and enamels with more than 3,000 tones and shades. While the company proudly conserves its heritage and historical knowledge, it also puts a strong focus on design and innovation. In 2003, Orsoni was incorporated into the Trend Group. Orsoni is a historic Venetian furnace that uses the same techniques from 1888 to produce 24K gold leaf mosaics and enamels with more than 3,000 tones and shades. While the company proudly conserves its heritage and historical knowledge, it also put a strong focus on design and innovation. In 2003, Orsoni was incorporated into the Trend Group. Italy Silvio Antiga Movable type printing workshop and museum Wood-cut letters: wood typefaces, introduced in 1800, handcrafted using pear and cherry wood. The Tipoteca Italiana foundation was inaugurated in 1995 and a museum to promote and preserve the heritage of Italian typography opened its doors in 2002. The foundation also hosts educational workshops for schools, scholars and enthusiasts from around the world. Silvio Antiga opened Grafiche Antiga printing company in 1968. 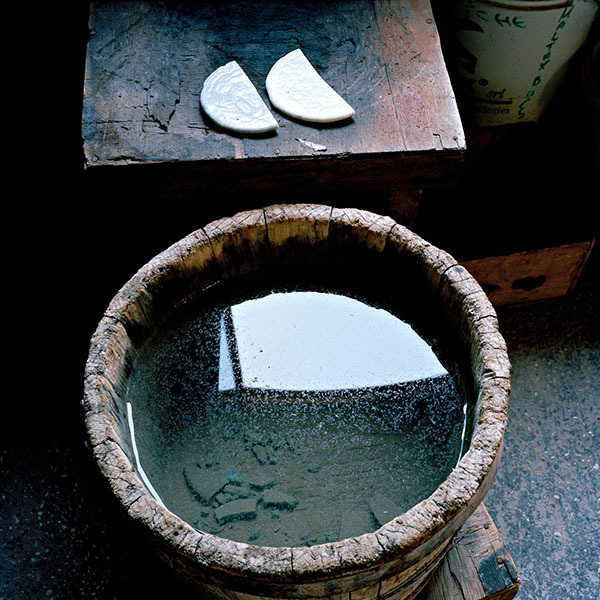 During the 1980s, the desire to preserve the character of early printing motivated Silvio to collect artefacts related to traditional methods of printing. Typefaces are set on paper and passed through a hand-operated printing press. 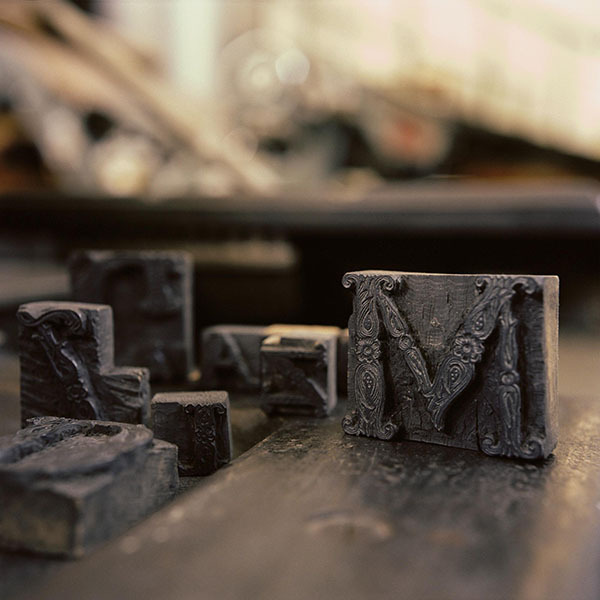 Typefaces are set on paper and passed through a hand-operated printing press. The Tipoteca Italiana foundation was inaugurated in 1995 and a museum to promote and preserve the heritage of Italian typography opened its doors in 2002. The foundation also hosts educational workshops for schools, scholars and enthusiasts from around the world. Silvio Antiga opened Grafiche Antiga printing company in 1968. During the 1980s, the desire to preserve the character of early printing motivated Silvio to collect artefacts related to traditional methods of printing. Italy Marino Menegazzo of Mario Berta Battiloro Handmade gold leaf Perfect gold leaf: hand-beaten, cut and carefully positioned between thin layers of paper. 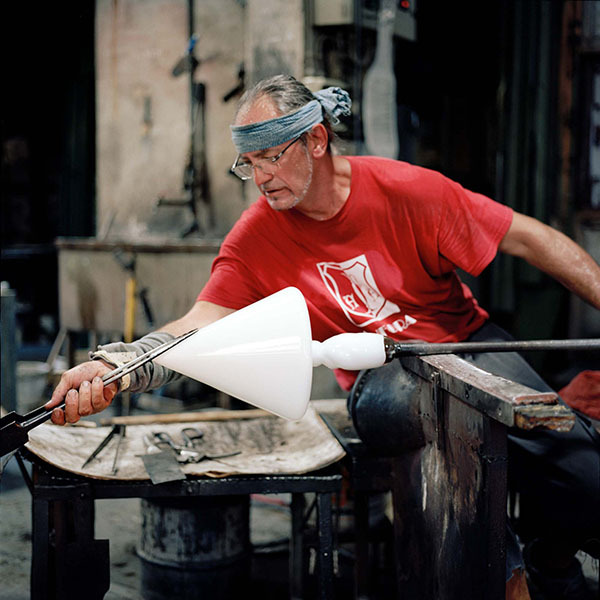 Italy Andrea Zilio Creative glasswork To each art its tools: compasses used to check the diameter of spheres and drinking glasses during the blowing process. Fornace Anfora (Anfora glassworks), is located on the island of Serenella, Murano. Andrea Zilio’s brother-in-law, Renzo Ferro, runs the workshop. At the time when Andrea joined Anfora, Renzo’s father Giulio ran the workshop as well as Andrea's training, which put a strong emphasis on copying historical works of blown glass. This mastery of complex traditional techniques provided Andrea with the necessary knowledge to allow him to innovate, creating contemporary objects. Italy Emanuele Bevilacqua Brocade and fine fabrics Loom in motion: red silk threads. Luigi Bevilacqua created Tessitura Luigi Bevilacqua in 1875. At the time, Luigi acquired 18th century weaving looms from a silk-weaving school in Venice. The same machines weave thread in the mill to this day by means of Jacquards, 21st century punch cards and replacement parts taken from other machines. Mathematical designs are transferred to a series of perforated cards, the work is then executed and cut manually by a team of expert weavers in the mill. Weavers work on Jacquard looms cutting each millimetre of the fabric by hand. The intricacy of the woven process means that only 30 to 80 centimetres of velvet can be woven per day. 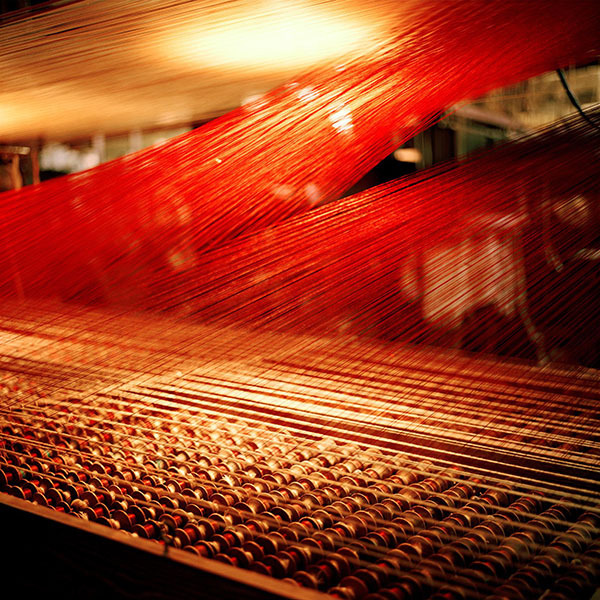 Weavers work on Jacquard looms cutting each millimetre of the fabric by hand. The intricacy of the woven process means that only 30 to 80 centimetres of velvet can be woven per day. Luigi Bevilacqua created Tessitura Luigi Bevilacqua in 1875. 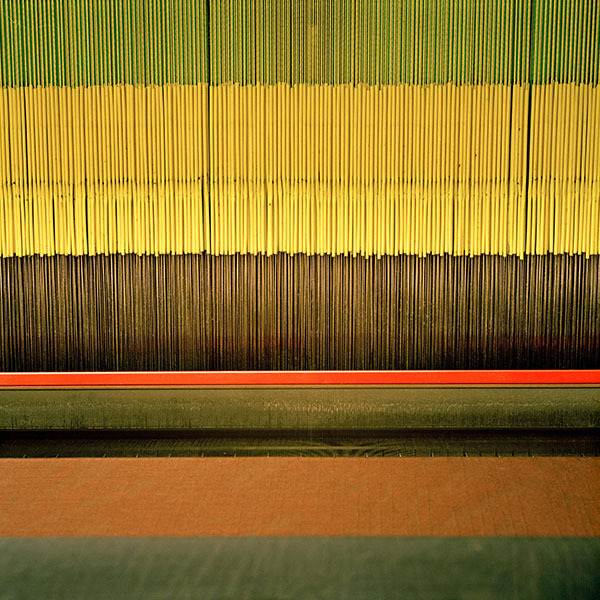 At the time, Luigi acquired 18th century weaving looms from a silk-weaving school in Venice. The same machines weave thread in the mill to this day by means of Jacquards, 21st century punch cards and replacement parts taken from other machines. Mathematical designs are transferred to a series of perforated cards, the work is then executed and cut manually by a team of expert weavers in the mill. Italy Sergio & Massimo Boldrin Papier-mâché masks Sleeping masks: a detail of the workshop. Stimulated by the revival of the carnival in the late 1970s, Sergio Boldrin founded La Bottega dei Mascareri in 1984. He and his younger brother Massimo create and finish their hand-painted masks following rich traditions and knowledge of a centuries-old craft that dates back to the 13th century. The masks are modelled in plaster moulds and then decorated with acrylic or watercolour paint. 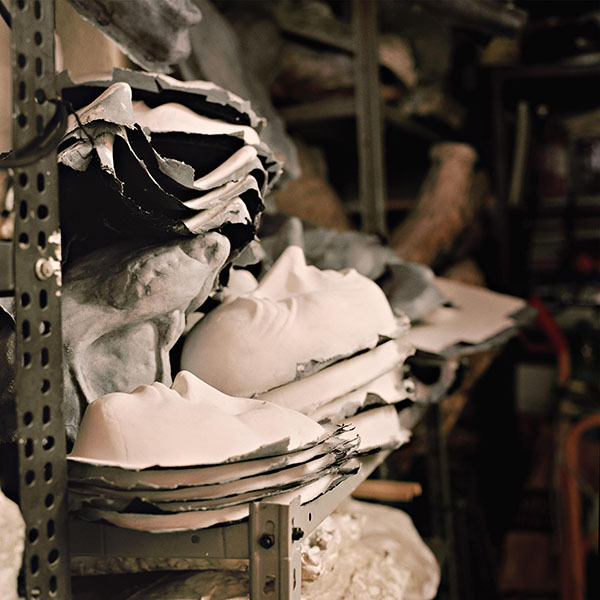 Their atelier is now one of the few remaining authentic mask making workshops in Venice. The masks are created by combining traditional elements, typical to the creation of Venetian masks. The masks are modelled in plaster moulds, then decorated with acrylic or watercolour paint. The masks are created by combining traditional elements, typical to the creation of Venetian masks. The masks are modelled in plaster moulds, then decorated with acrylic or watercolour paint. Stimulated by the revival of the carnival in the late 1970s, Sergio Boldrin founded La Bottega dei Mascareri in 1984. He and his younger brother Massimo create and finish their hand-painted masks following rich traditions and knowledge of a centuries-old craft that dates back to the 13th century. The masks are modelled in plaster moulds and then decorated with acrylic or watercolour paint. 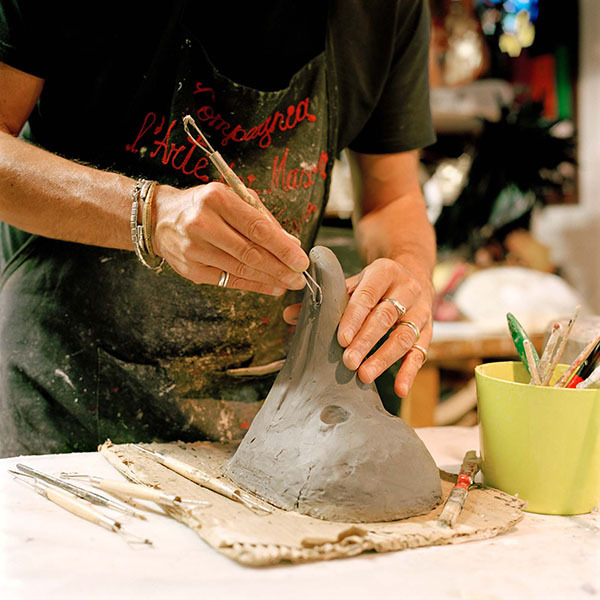 Their atelier is now one of the few remaining authentic mask making workshops in Venice. Italy Giovanni Bonotto Fine fabrics Mechanical frenzy: warp of the 1956 shuttle loom still in use. Founded by by Luigi Bonotto in 1912, Bonotto originally produced straw hats. By the 1960s, the small workshop had grown along with the Italian textile industry into a significant manufacturer of textiles. The company now employs over two hundred master artisans. Giovanni Bonotto, the creative director of the company, evokes the concept of a 'slow factory'. Rather than using automated electronic machines, Bonotto uses hand operated mechanical machines precisely because they are 'slow'. Italy Mario Bertolin Potter's wheel ceramics Twins: one clay piece fresh from the wheel and one ceramic “biscuit” just after the first firing. 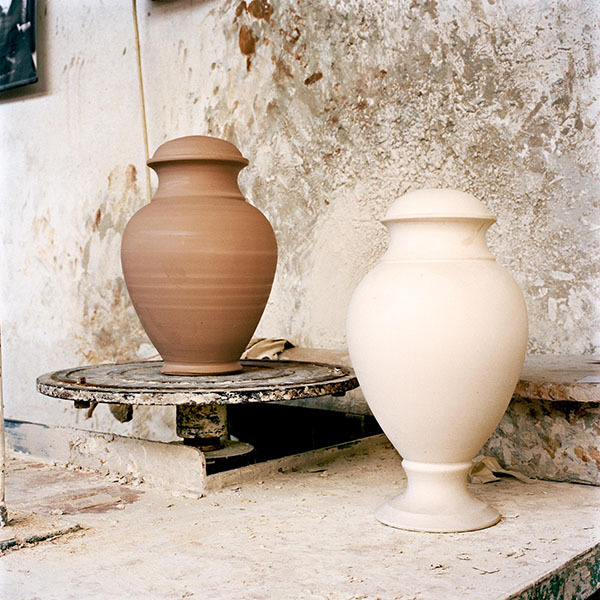 Mario Bertolin, his brother Luigi and his uncle Severino co-founded Ceramiche Artistiche 3B in 1978. Mario’s brother and uncle have now retired. Mario has dedicated the past 40 years to working exclusively by hand continuing the rich ceramic traditions of the city of Nove, Vicenza. He specialises in making unglazed fired biscuit earthenware, known in the region as “biscotto”. Another specialised artisan tends to the glazing, colouring and painting of the fired ceramic piece. 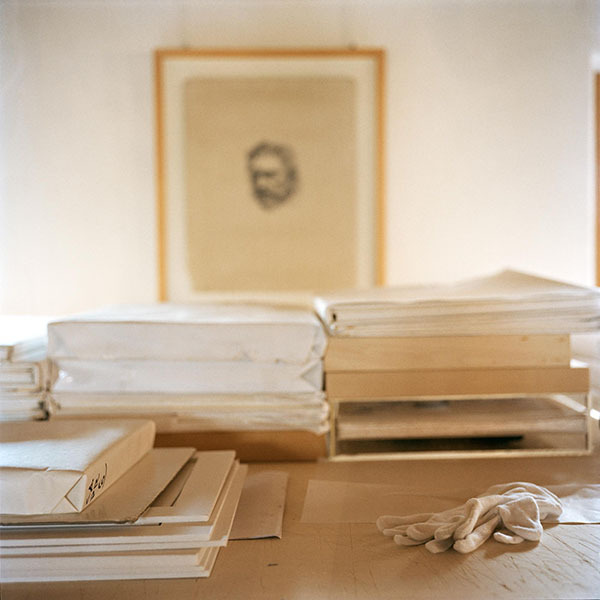 Italy Egidio Fiorin Limited edition artists’ books Colophonarte composition: paper and artists' special editions from historical books to ongoing projects. 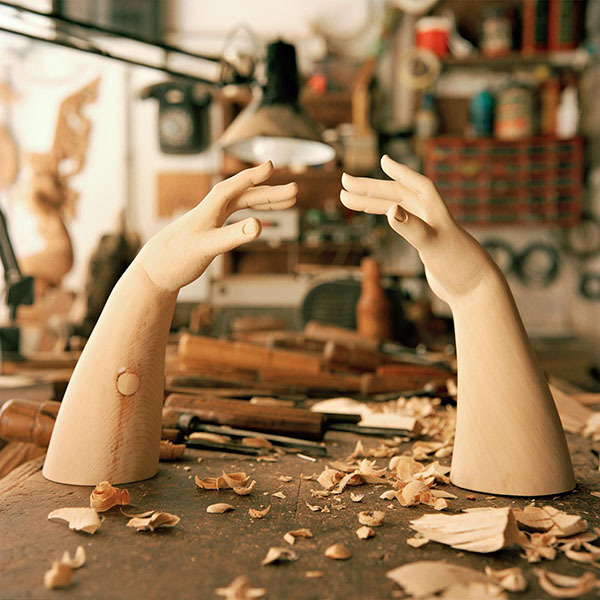 Italy Bruno Barbon wood inlay and antiques restoration Contemporary creation: hands of a blossoming young woman. 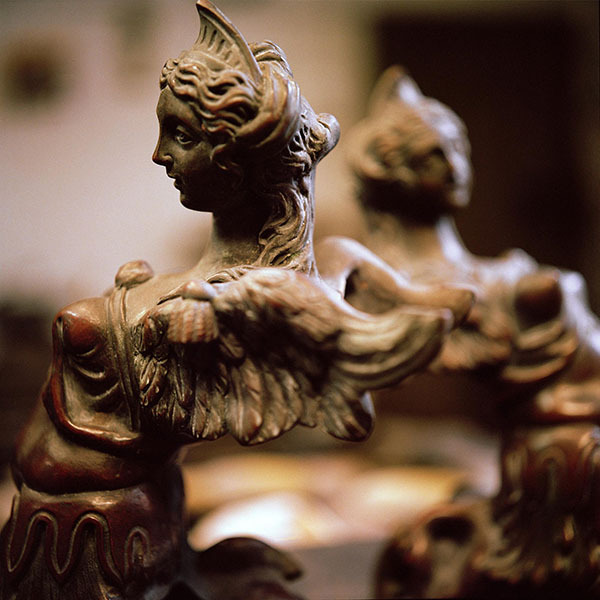 Bruno Barbon is a cabinetmaker and restorer who creates putti, candlesticks, frames, plaques, ornaments, sculptures, and furniture of all kinds. 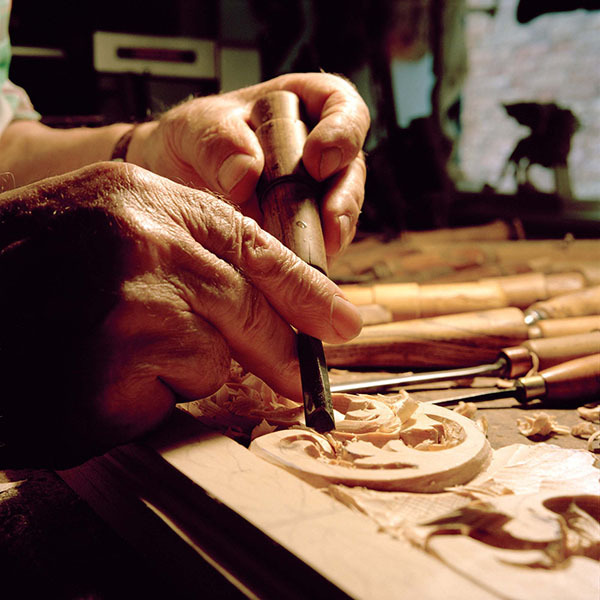 He is one of the few artisans who still carves the famous moretti veneziani (Venetian moors). His work ranges from creating pieces based on customer designs to reproductions of period pieces. He also restores furniture, chairs, console tables, frames, sculptures and wooden pieces of any period or style. Italy Giorgio Morelato Wood furniture Gold on white: series of small armchairs with dormeuse after being painted. 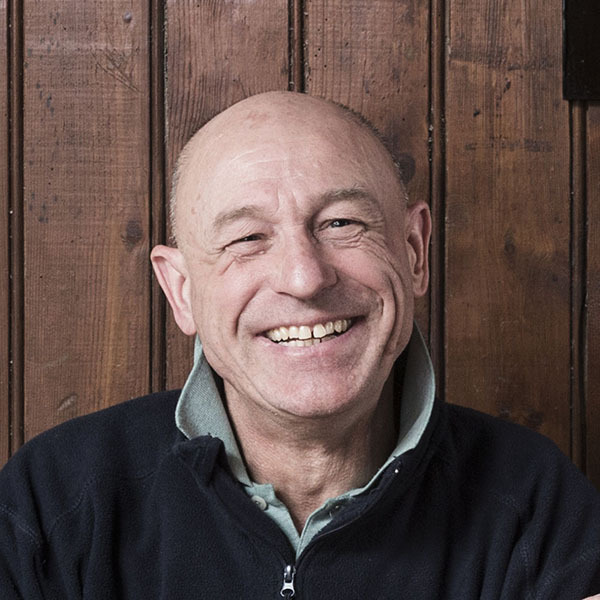 Giorgio Morelato is a master cabinetmaker and lends his name to the family workshop and company that crafts furniture. By combining time-honoured techniques and classical styles such as Biedermeier and Louis XVI with contemporary styles including modular designs, the workshop remains attached to local traditions while appealing to contemporary tastes. As well as designing its own furniture, the studio also works with internationally acclaimed designers. Italy Gianpaolo Fallani Artistic silk screen printing Suspension: the screen-printing squeegee on the hand-printing machine. Gianpaolo Fallani’s father Fiorenzo opened a screen-printing workshop in 1968. Gianpaolo now runs the screen-printing studio and shop. Gianpaolo has worked with many artists, organising residencies and workshops. The studio and shop is opened to the city through the hosting of numerous cultural events, concerts and exhibitions. Gianpaolo aims to keep the studio a vibrant place where artists can experiment and where the public can meet artists and see their work. An original (drawing, print, painting etc.) 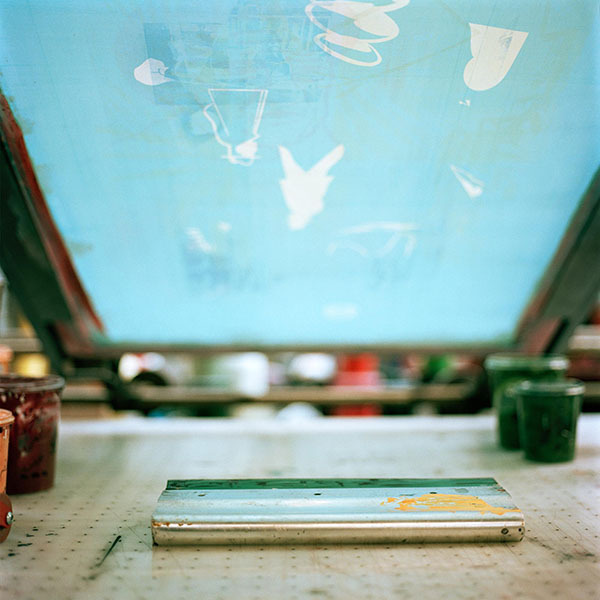 is photographically transferred to a silk screen, blocking non-printing areas like a stencil. Ink is then wiped across the screen and ink that is not blocked transfers onto a substrate surface. An original (drawing, print, painting etc.) is photographically transferred to a silk screen, blocking non-printing areas like a stencil. Ink is then wiped across the screen and ink that is not blocked transfers onto a substrate surface. 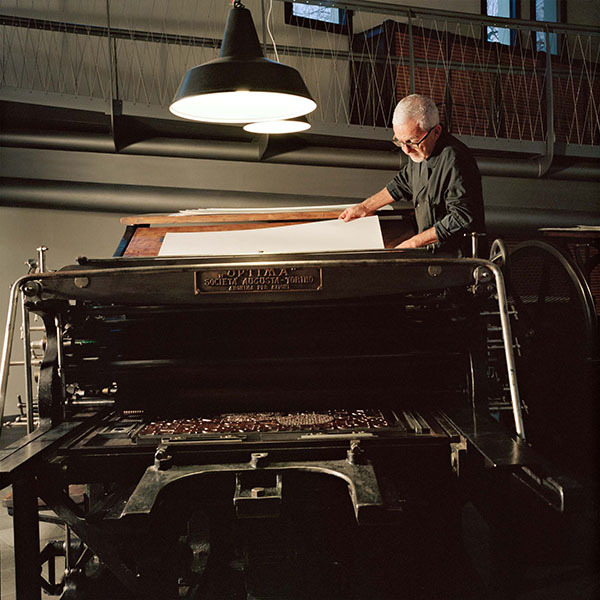 Gianpaolo Fallani’s father Fiorenzo opened a screen-printing workshop in 1968. Gianpaolo now runs the screen-printing studio and shop. Gianpaolo has worked with many artists, organising residencies and workshops. The studio and shop is opened to the city through the hosting of numerous cultural events, concerts and exhibitions. Gianpaolo aims to keep the studio a vibrant place where artists can experiment and where the public can meet artists and see their work. Italy Roberto Tramontin Gondolas shipyard From father to son: a wall inside the shipyard with a portrait of the founder. 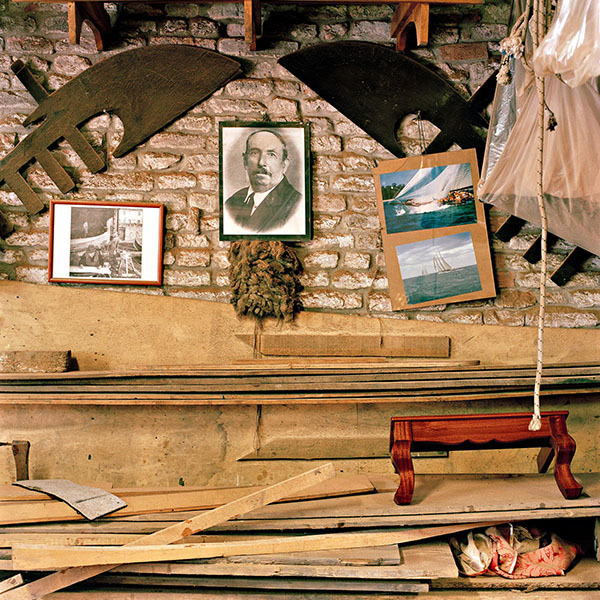 Domenico Tramontin e Figli boatyard has been making handmade gondolas since Domenico Tramontin created the workshop in 1884. Domenico’s great-grandson, Roberto Tramontin, now runs the workshop and continues to make gondolas in the same way. A team of expert artisans work on the gondolas by hand and continue to use a design created by Domenico that truly revolutionised the gondola industry. Before Domenico’s design, a gondola would require two gondoliers to row it, but Domenico’s design curved the bottom of the boat in such a way that the weight imbalance creates a natural bias towards one side. As a result, the gondola can be propelled from one side only without altering its course. Italy Carlo Semenzato Artistic metalwork in brass and bronze Treasures from the archive: patinated bronze ornament for a gondola. Valese is the last foundry in Venice. Managed by Carlo Semenzato, Valese continues to produce objects in bronze and brass following traditional techniques of production. Molten metal is poured into moulds using the sand casting method, which uses sand as the mould material. As well as producing models of Saint Mark’s horses, moretti (Moors) and Saint Mark’s lion, Valese produces ornaments for gondolas, and complex objects such as chandeliers. 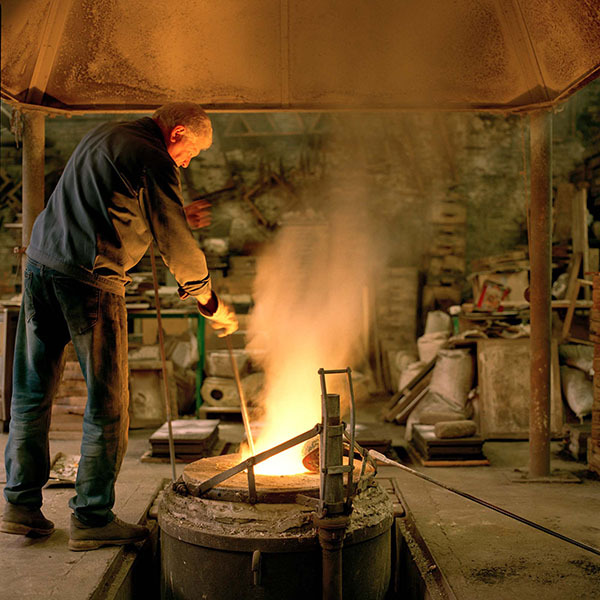 Metal casting in bronze and brass following traditional foundry techniques of production. Metal casting in bronze and brass following traditional foundry techniques of production. Valese is the last foundry in Venice. Managed by Carlo Semenzato, Valese continues to produce objects in bronze and brass following traditional techniques of production. Molten metal is poured into moulds using the sand casting method, which uses sand as the mould material. As well as producing models of Saint Mark’s horses, moretti (Moors) and Saint Mark’s lion, Valese produces ornaments for gondolas, and complex objects such as chandeliers. Italy Andrea Zilio Creative glasswork Fornace Anfora (Anfora glassworks), is located on the island of Serenella, Murano. Andrea Zilio’s brother-in-law, Renzo Ferro, runs the workshop. At the time when Andrea joined Anfora, Renzo’s father Giulio ran the workshop as well as Andrea's training, which put a strong emphasis on copying historical works of blown glass. This mastery of complex traditional techniques provided Andrea with the necessary knowledge to allow him to innovate, creating contemporary objects. With his left hand, the artisan holds a metal punty with a large opaque piece of cast glass joined to its tip. The approximately five-foot rod, known as a punty, rests on a wooden support, permitting the artist to rotate the glass. With his right hand, the artisan shapes the glass with a pair of metal tweezers called a jack. Italy Emanuele Bevilacqua Brocade and fine fabrics Luigi Bevilacqua created Tessitura Luigi Bevilacqua in 1875. At the time, Luigi acquired 18th century weaving looms from a silk-weaving school in Venice. The same machines weave thread in the mill to this day by means of Jacquards, 21st century punch cards and replacement parts taken from other machines. Mathematical designs are transferred to a series of perforated cards, the work is then executed and cut manually by a team of expert weavers in the mill. 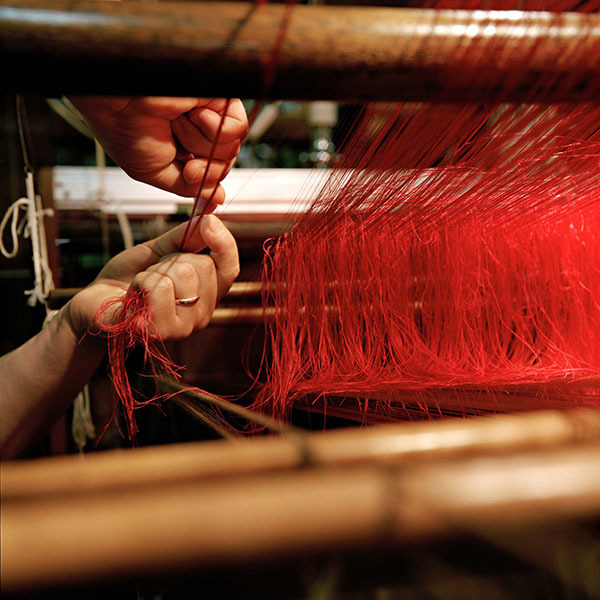 Master weavers’ hands carefully separate red threads of the warp to prepare the Jacquard loom for weaving brocade patterns. The 18th century loom originally used for silk weaving here weaves velvets, silks and damasks. 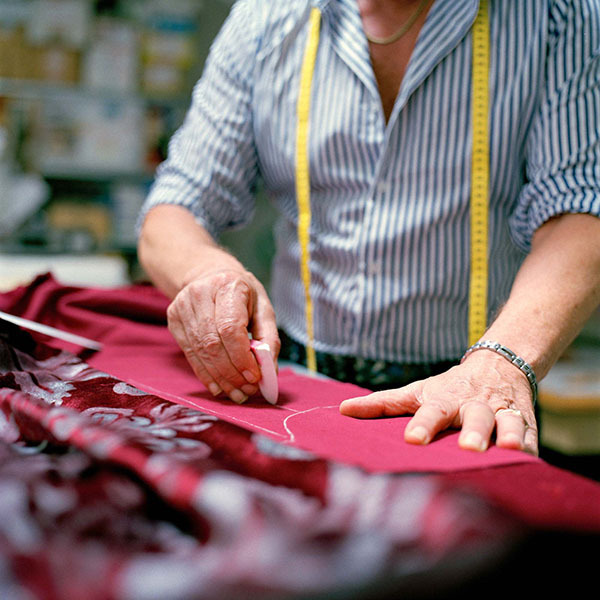 Italy Stefano Nicolao Theatre tailoring Stefano Nicolao created Nicolao Atelier Sartoria Teatrale, a Venetian costume-tailoring workshop, in the 1980s. The period costumes created in this atelier are completely worked on by hand, and precious fabrics are sewn together using techniques and styles faithful to the original period designs. The costumes produced in the workshop are commissioned and exhibited internationally, in opera houses, theatres, ballets, cinemas and on television. A tailor firmly holds down a piece of fabric with one hand, and with the other marks alterations onto the fabric with a chalk. The lines and marks will be brushed off the material once the alterations have been made. Italy Lucia Costantini Merletto lacemaking Practised by women in her family and in the neighbourhood of Burano as a passion rather than profession, Lucia Costantini grew up immersed in the craft of merletto lacemaking. Aged 11, Lucia started to attend a lace school run by nuns after which she followed a Veneto region training course. Passionate about innovation, Lucia goes beyond the traditional limits of lacemaking by combining traditional patterns and techniques with her own pioneering methods. Practised by women in her family and in the neighbourhood of Burano as a passion rather than profession, Lucia Costantini grew up immersed in the craft of merletto lacemaking. Aged 11, Lucia started to attend a lace school run by nuns after which she followed a Veneto region training course. Passionate about innovation, Lucia goes beyond the traditional limits of lacemaking by combining traditional patterns and techniques with her own pioneering methods. In order to hand-sew the needle stitches that make up the detailed lace patterns, Lucia first makes a line drawing of the design. She layers this with paper and uses a Singer Treadle sewing machine to sew the outline of the design. Practised by women in her family and in the neighbourhood of Burano as a passion rather than profession, Lucia Costantini grew up immersed in the craft of merletto lacemaking. Aged 11, Lucia started to attend a lace school run by nuns after which she followed a Veneto region training course. Passionate about innovation, Lucia goes beyond the traditional limits of lacemaking by combining traditional patterns and techniques with her own pioneering methods. The merlettaia (lacemaker) carefully pulls a thin piece of white thread through the fabric. 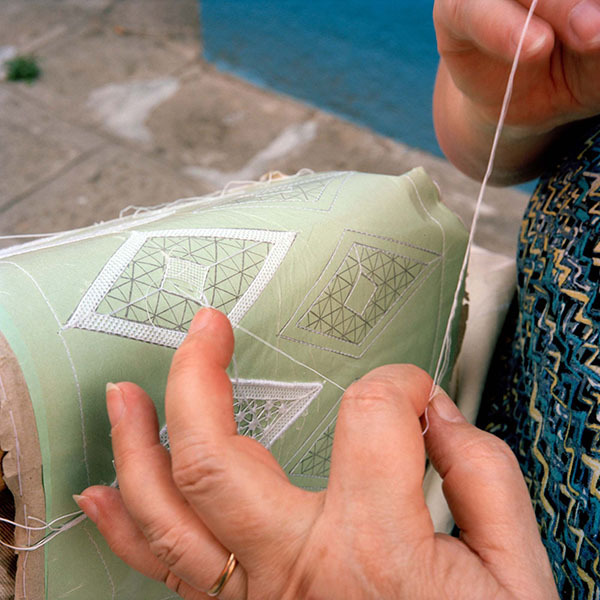 Triangle shaped outlines are sewn onto a piece of green fabric preparing it for intricate merletto lacemaking. Italy Roberto Tramontin Gondolas shipyard Domenico Tramontin e Figli boatyard has been making handmade gondolas since Domenico Tramontin created the workshop in 1884. 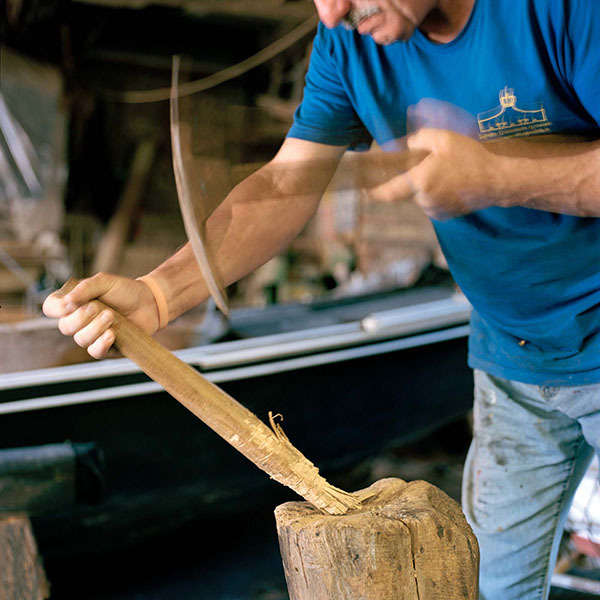 Domenico’s great-grandson, Roberto Tramontin, now runs the workshop and continues to make gondolas in the same way. A team of expert artisans work on the gondolas by hand and continue to use a design created by Domenico that truly revolutionised the gondola industry. Before Domenico’s design, a gondola would require two gondoliers to row it, but Domenico’s design curved the bottom of the boat in such a way that the weight imbalance creates a natural bias towards one side. As a result, the gondola can be propelled from one side only without altering its course. This picture catches the fleeting moment when the cutting edge of a carpenter’s adze is powerfully swung down towards a large dowel-like piece of wood to carefully remove a layer of wood. Italy Sergio & Massimo Boldrin Papier-mâché masks Stimulated by the revival of the carnival in the late 1970s, Sergio Boldrin founded La Bottega dei Mascareri in 1984. He and his younger brother Massimo create and finish their hand-painted masks following rich traditions and knowledge of a centuries-old craft that dates back to the 13th century. The masks are modelled in plaster moulds and then decorated with acrylic or watercolour paint. Their atelier is now one of the few remaining authentic mask making workshops in Venice. The artisan carefully reworks the surface of a handmade papier-mâché mask made in a plaster mould. Two other masks lie on the artisan's table. Italy Riccardo Bisazza Glass mosaic tiles Orsoni is a historic Venetian furnace that uses the same techniques from 1888 to produce 24K gold leaf mosaics and enamels with more than 3,000 tones and shades. While the company proudly conserves its heritage and historical knowledge, it also put a strong focus on design and innovation. In 2003, Orsoni was incorporated into the Trend Group. 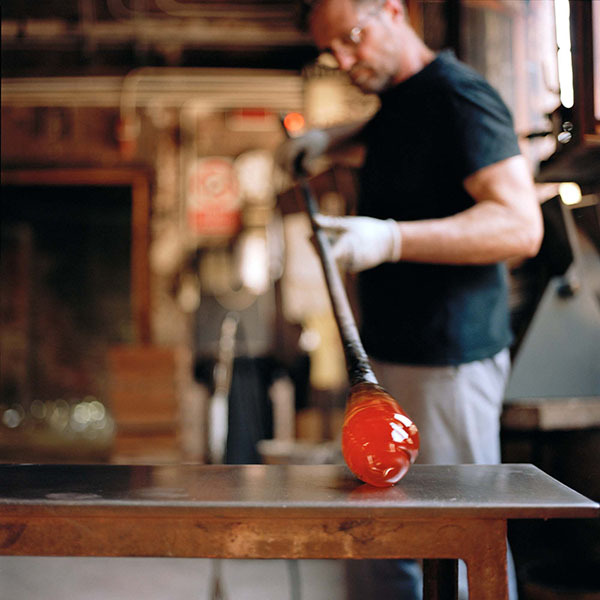 A glasswork artisan rolls a piece of freshly blown glass across the surface of a metal marver to form it into a cylindrical shape and cool the glass down. The glass that is held on a punty will eventually be blown and cut out to make glass gold leaf mosaic tiles. Italy Giampaolo Babetto Artistic jewellery Master goldsmith Giampaolo Babetto began working with metal in 1969. Giampaolo does not wish to reflect outward appearances through his work but rather the essence of objects. This has driven him to work with geometric forms, creating works that reflect a minimalist, architectural to figurative range of styles. To achieve distinctive colours and delicate textures, he personally prepares a metal alloy of his creation. He textures the surfaces by beating and often scratching the gold. 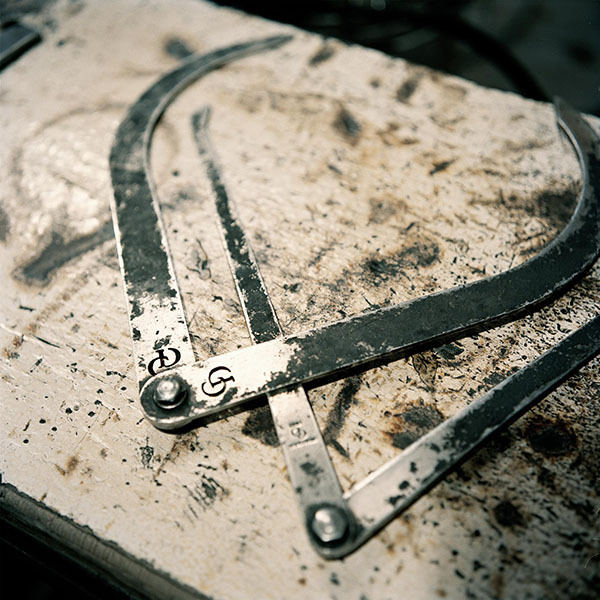 Master goldsmith Giampaolo Babetto began working with metal in 1969. Giampaolo does not wish to reflect outward appearances through his work but rather the essence of objects. This has driven him to work with geometric forms, creating works that reflect a minimalist, architectural to figurative range of styles. To achieve distinctive colours and delicate textures, he personally prepares a metal alloy of his creation. He textures the surfaces by beating and often scratching the gold. 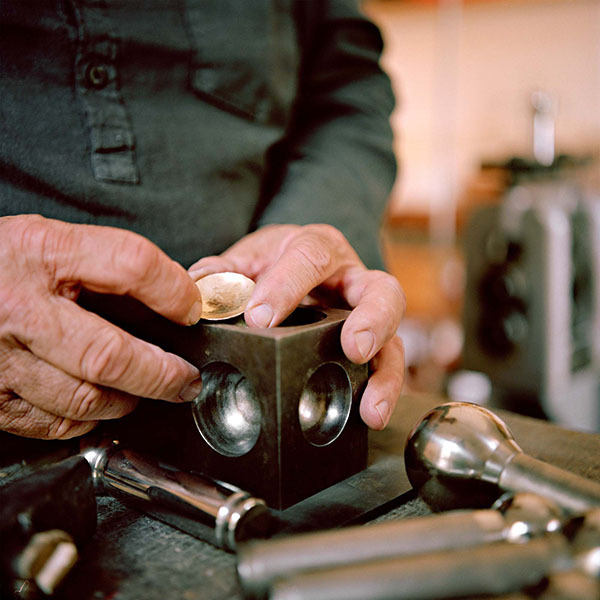 A goldsmith inspects a piece of precious metal that has just been hand-shaped using a dappling block. It is shaped by hammering different types of dappling punches into the metal, which is placed in the metal cube-forming block with half-round grooves. 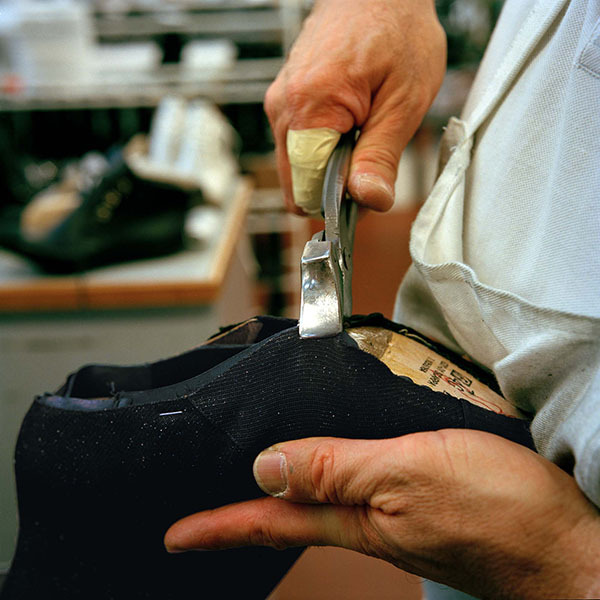 Italy Gabriella, Reanna & Alessandro Ballin Shoemaking Ballin shoes was founded in 1945 by two brothers, Giorgio and Guido Ballin, and is now based in the Rivera Del Brenta in the Province of Venice. Giorgio’s three children, Gabriella, Reanna and Alessandro, took over management of the business in the 90s. Ballin continues to offer impeccably made footwear, thanks to the attention paid in constructing the forms and to considerable manual input at all stages of the production chain. Ballin shoes was founded in 1945 by two brothers, Giorgio and Guido Ballin, and is now based in the Rivera Del Brenta in the Province of Venice. Giorgio’s three children, Gabriella, Reanna and Alessandro, took over management of the business in the 90s. Ballin continues to offer impeccably made footwear, thanks to the attention paid in constructing the forms and to considerable manual input at all stages of the production chain. The artisan is connecting the stretched and stapled upper to the wood inner sole of the shoe. Italy Giovanni Bonotto Fine fabrics Founded by by Luigi Bonotto in 1912, Bonotto originally produced straw hats. By the 1960s, the small workshop had grown along with the Italian textile industry into a significant manufacturer of textiles. The company now employs over two hundred master artisans. Giovanni Bonotto, the creative director of the company, evokes the concept of a 'slow factory'. Rather than using automated electronic machines, Bonotto uses hand operated mechanical machines precisely because they are 'slow'. 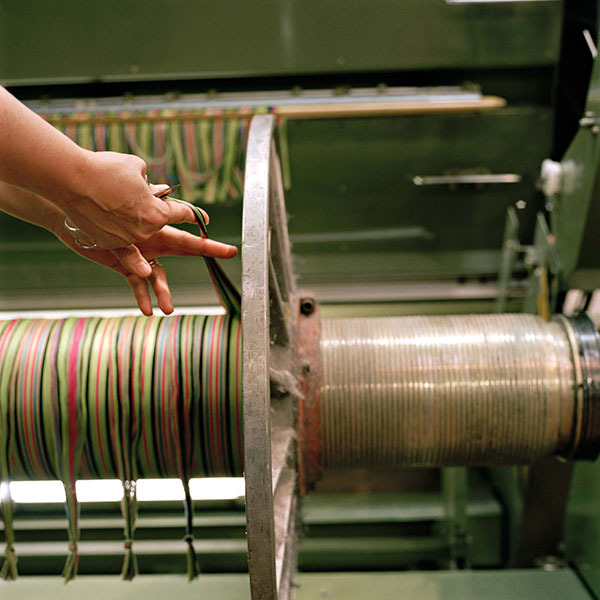 After a machine finishes preparing the weft threats, a worker manually knots the weft to keep the right number of threats separated. Italy Mario Bertolin Potter's wheel ceramics Mario Bertolin, his brother Luigi and his uncle Severino co-founded Ceramiche Artistiche 3B in 1978. Mario’s brother and uncle have now retired. Mario has dedicated the past 40 years to working exclusively by hand continuing the rich ceramic traditions of the city of Nove, Vicenza. He specialises in making unglazed fired biscuit earthenware, known in the region as “biscotto”. Another specialised artisan tends to the glazing, colouring and painting of the fired ceramic piece. 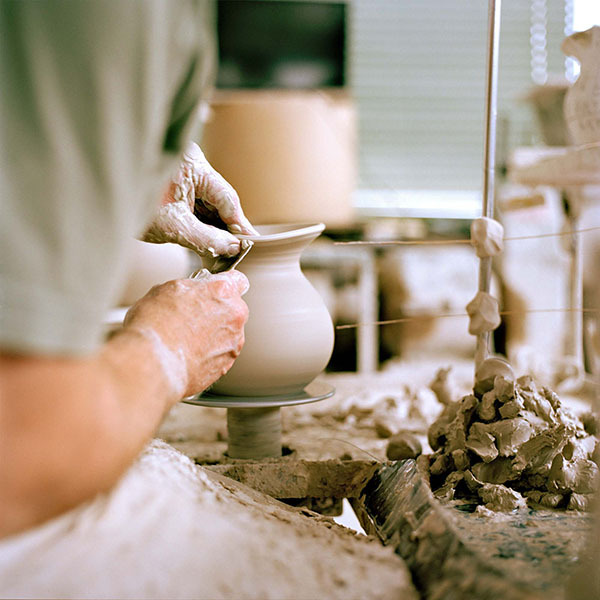 Using a metal fluting tool, the artisan shapes the surface of a clay jug being formed on a spinning lathe. Italy Giovanni Battista Fadigati Ceramics and painted porcelain Giovanni Battista Fadigati's uncle bought Este Ceramiche Porcellane in 1955 and Giovanni has run the company since 1975. When Giovanni’s uncle bought the factory, he discovered a vast collection of semi-buried moulds and dyes. This priceless discovery permits the company to perpetuate a rich artisanal legacy. Very much in the spirit of this tradition, the porcelain making process is entirely carried out by hand, from the creation of plaster moulds up to the final brush strokes. Giovanni Battista Fadigati's uncle bought Este Ceramiche Porcellane in 1955 and Giovanni has run the company since 1975. When Giovanni’s uncle bought the factory, he discovered a vast collection of semi-buried moulds and dyes. This priceless discovery permits the company to perpetuate a rich artisanal legacy. Very much in the spirit of this tradition, the porcelain making process is entirely carried out by hand, from the creation of plaster moulds up to the final brush strokes. Liquid clay is poured into plaster moulds. Once the moulds absorb the water, the fragile objects are closely inspected, then fired. Digitally designed motifs are then transposed by hand to the white porcelain. Liquid clay is poured into plaster moulds. Once the moulds absorb the water, the fragile objects are closely inspected, then fired. Digitally designed motifs are then transposed by hand to the white porcelain. Giovanni Battista Fadigati's uncle bought Este Ceramiche Porcellane in 1955 and Giovanni has run the company since 1975. When Giovanni’s uncle bought the factory, he discovered a vast collection of semi-buried moulds and dyes. This priceless discovery permits the company to perpetuate a rich artisanal legacy. Very much in the spirit of this tradition, the porcelain making process is entirely carried out by hand, from the creation of plaster moulds up to the final brush strokes. 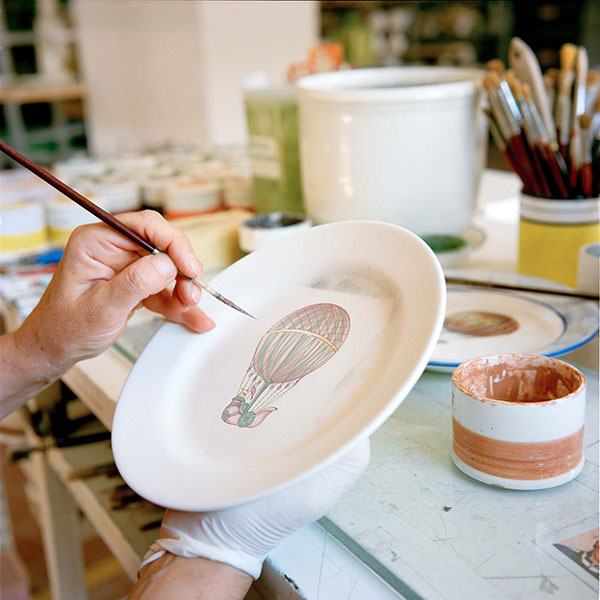 An artisan is poised to continue painting an air-balloon design by hand on the surface of a plate held up in their right hand. The colour will change during the firing so the artisan has to know exactly how it will look once fired. A complete version of the plate’s painted design can be seen in the background. Italy Tiziano Spigariol Tailoring traditional Venetian capes Tabarrificio Trevisino is one of the few companies that has retained knowledge of the artisanal technique of creating Tabarro cloaks. While the advent of the coat led to a decline in interest for cloaks, over the past years these have started to come back into fashion thanks to the dedication of companies such as Tabarrificio Trevisino. While Tabarro are the signature creation of this tailor’s workshop, it also produces other custom-made items of clothing. Tabarrificio Trevisino is one of the few companies that has retained knowledge of the artisanal technique of creating Tabarro cloaks. While the advent of the coat led to a decline in interest for cloaks, over the past years these have started to come back into fashion thanks to the dedication of companies such as Tabarrificio Trevisino. While Tabarro are the signature creation of this tailor’s workshop, it also produces other custom-made items of clothing. 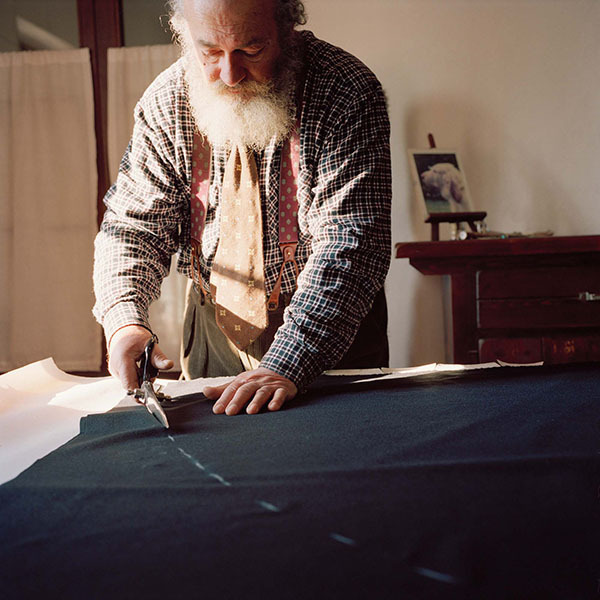 Master tailor Tiziano Spigariol cuts dark fabric following a drawn chalk line. 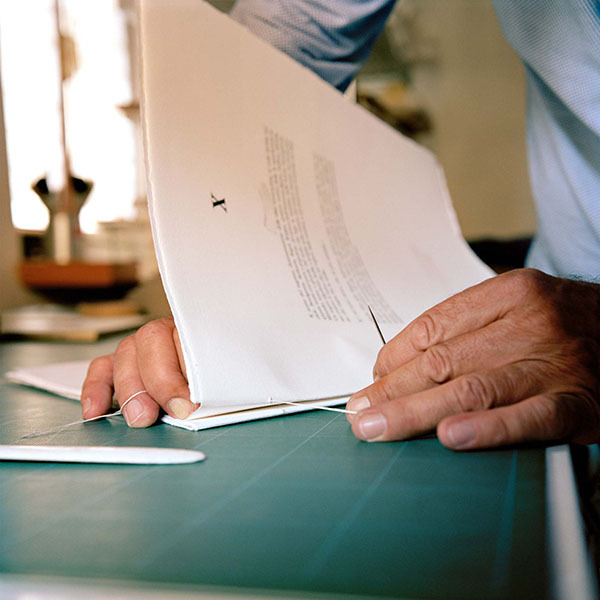 A bookbinder is passing a thread with a needle through carefully stacked sheets of paper in order to hold them together. Italy Marino Menegazzo Handmade gold leaf Marino and Sabina work in the atelier Mario Berta Battiloro in Venice. In this historic artisanal laboratory, gold, silver and other precious metals are hammered into ultra-thin leaves, ready to be used in a number of fields. Founded in 1969 by Sabina’s father, Mario Berta, the small workshop aims to continue the family trade started in 1926. 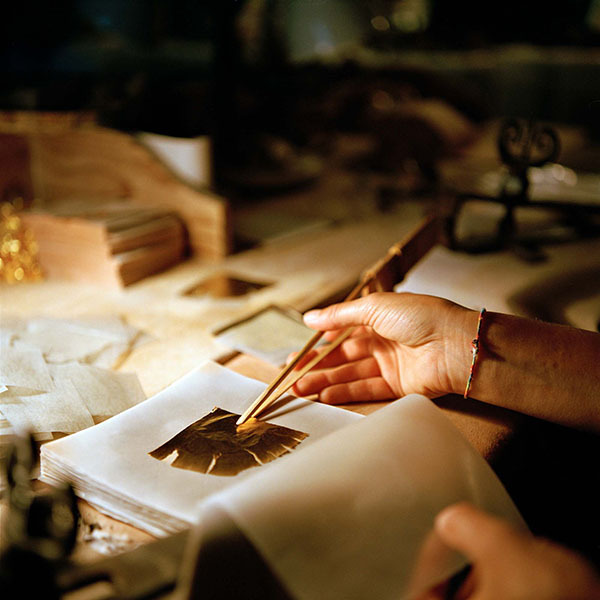 Marino Menegazzo is one of the last artisans left in Europe able to turn an ingot into gold leaf by hand, an ancient profession that came to Venice from Byzantium in the 11th century. Marino and Sabina work in the atelier Mario Berta Battiloro in Venice. In this historic artisanal laboratory, gold, silver and other precious metals are hammered into ultra-thin leaves, ready to be used in a number of fields. Founded in 1969 by Sabina’s father, Mario Berta, the small workshop aims to continue the family trade started in 1926. Marino Menegazzo is one of the last artisans left in Europe able to turn an ingot into gold leaf by hand, an ancient profession that came to Venice from Byzantium in the 11th century. Using an ancient technique, the artisan beats gold leaf by hand on top of a grey marble surface. Using an ancient technique, the artisan beats gold leaf by hand on top of a grey marble surface. Marino and Sabina work in the atelier Mario Berta Battiloro in Venice. In this historic artisanal laboratory, gold, silver and other precious metals are hammered into ultra-thin leaves, ready to be used in a number of fields. Founded in 1969 by Sabina’s father, Mario Berta, the small workshop aims to continue the family trade started in 1926. Marino Menegazzo is one of the last artisans left in Europe able to turn an ingot into gold leaf by hand, an ancient profession that came to Venice from Byzantium in the 11th century. An expert artisan has cut the gold leaf and now places the leaves one by one onto the paper pages of a booklet using long tweezers. The artisan uses wood pincers to avoid the electrostatic energy. 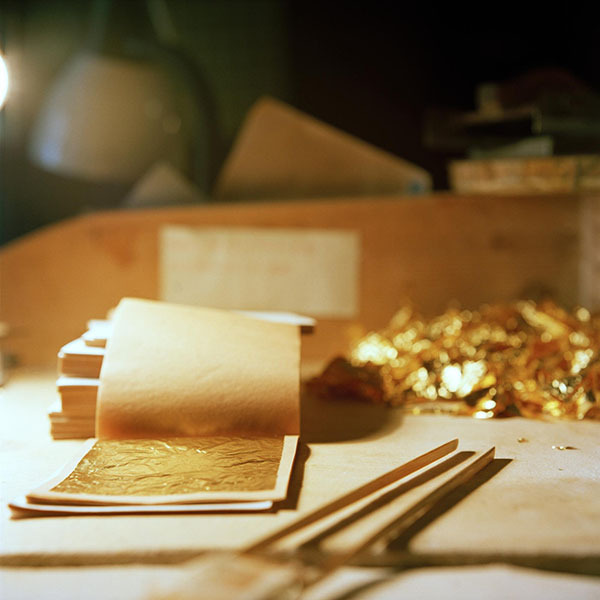 Once filled, the booklet will be hammered intensively until the gold leaf reaches the desired thickness. Italy Bruno Barbon wood inlay and antiques restoration Bruno Barbon is a cabinetmaker and restorer who creates putti, candlesticks, frames, plaques, ornaments, sculptures, and furniture of all kinds. He is one of the few artisans who still carves the famous moretti veneziani (Venetian moors). His work ranges from creating pieces based on customer designs to reproductions of period pieces. He also restores furniture, chairs, console tables, frames, sculptures and wooden pieces of any period or style. Using a paring chisel, cabinetmaker Bruno Barbon carefully carves floral patterns onto a wooden surface. He uses the force of his left hand to push the chisel and guides it with his right hand. 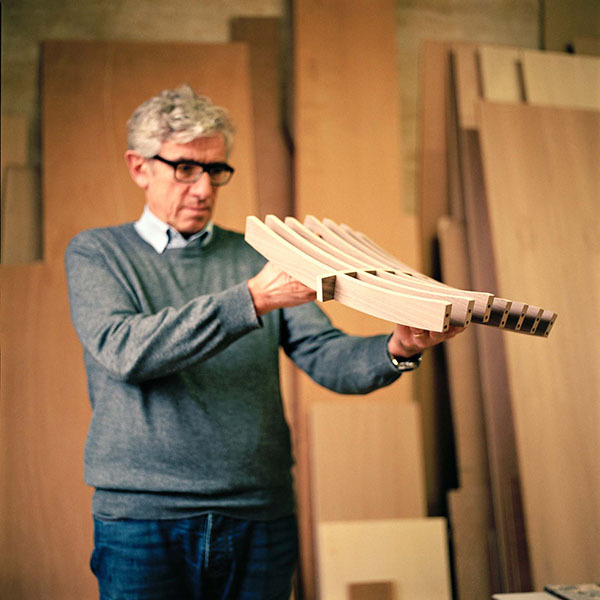 Italy Giorgio Morelato Wood furniture Giorgio Morelato is a master cabinetmaker and lends his name to the family workshop and company that crafts furniture. 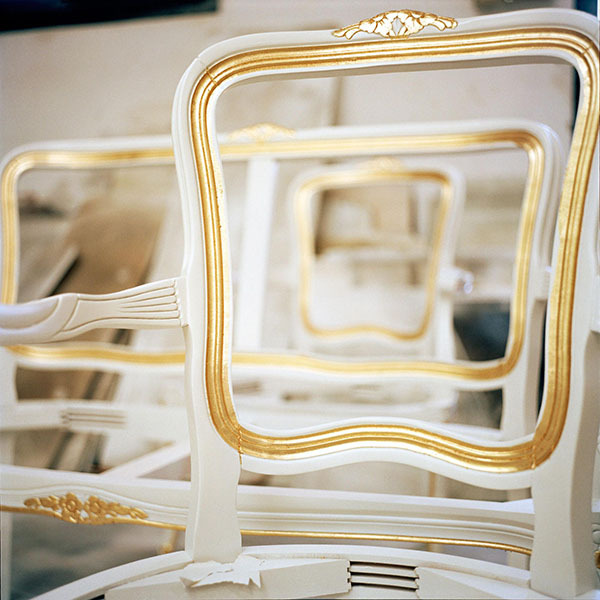 By combining time-honoured techniques and classical styles such as Biedermeier and Louis XVI with contemporary styles including modular designs, the workshop remains attached to local traditions while appealing to contemporary tastes. As well as designing its own furniture, the studio also works with internationally acclaimed designers. Standing in his workshop, Giorgio Morelato inspects the curved surface of joined pieces of wood assembled in the workshop. Italy Carlo Semenzato Artistic metalwork in brass and bronze Valese is the last foundry in Venice. Managed by Carlo Semenzato, Valese continues to produce objects in bronze and brass following traditional techniques of production. Molten metal is poured into moulds using the sand casting method, which uses sand as the mould material. As well as producing models of Saint Mark’s horses, moretti (Moors) and Saint Mark’s lion, Valese produces ornaments for gondolas, and complex objects such as chandeliers. A master metalworker stands over a glowing hot crucible embedded in the ground of the foundry. Using a glove, he places a rod into the crucible. Italy Gianpaolo Fallani Artistic silk screen printing Gianpaolo Fallani’s father Fiorenzo opened a screen-printing workshop in 1968. Gianpaolo now runs the screen-printing studio and shop. Gianpaolo has worked with many artists, organising residencies and workshops. The studio and shop is opened to the city through the hosting of numerous cultural events, concerts and exhibitions. Gianpaolo aims to keep the studio a vibrant place where artists can experiment and where the public can meet artists and see their work. 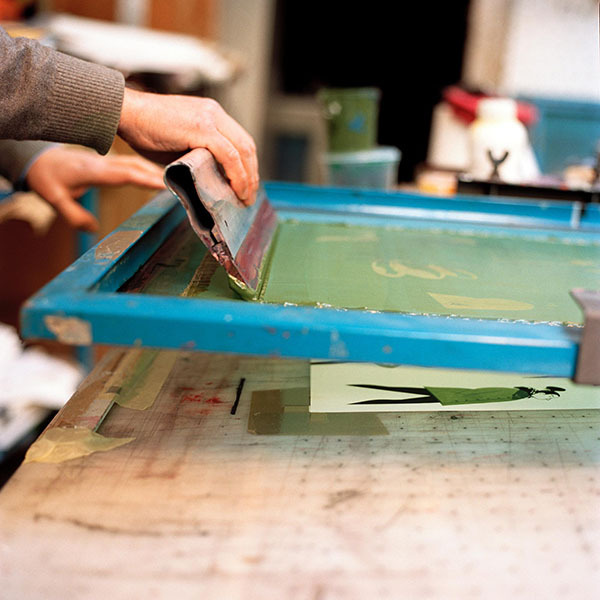 A screen printer spreads an emulsion mixture on the screen with the squeegee. The emulsion will cover a slightly larger area than the desired print. Italy Bocchese Knitwear Silvia Stein Bocchese and her husband founded Maglificio Miles, a high-quality knitwear producer, in 1962. Silvia remains the president, but her four children now run the family company as a team. Maglificio Miles makes sure that designers’ ideas are finished to the highest possible standards by an expert team of artisans with wide-ranging skills. The company collaborates with some of the best names in fashion, including Azzedine Alaïa with whom it has worked for nearly 40 years. Silvia Stein Bocchese and her husband founded Maglificio Miles, a high-quality knitwear producer, in 1962. Silvia remains the president, but her four children now run the family company as a team. Maglificio Miles makes sure that designers’ ideas are finished to the highest possible standards by an expert team of artisans with wide-ranging skills. The company collaborates with some of the best names in fashion, including Azzedine Alaïa with whom it has worked for nearly 40 years. Digitally controlled knitting machines making jacquard and fur stiches are combined with a variety of artisanal techniques to create innovative designs. 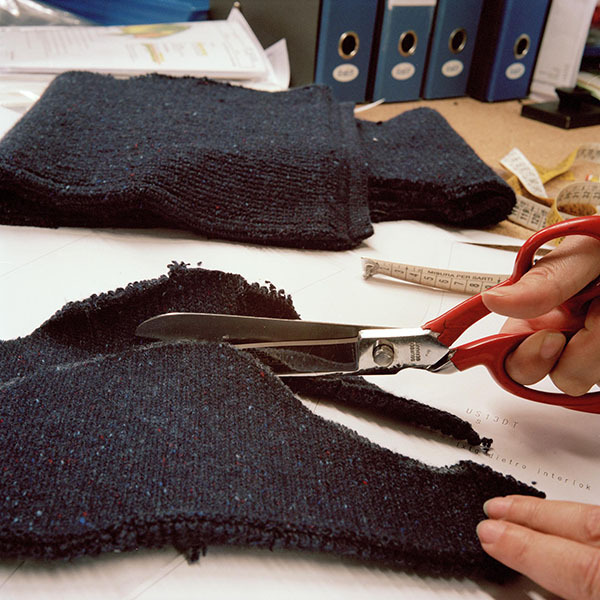 Garments are modelled and tailored, each piece is linked together and the finishing touches sewed stitch by stitch. Digitally controlled knitting machines making jacquard and fur stiches are combined with a variety of artisanal techniques to create innovative designs. Garments are modelled and tailored, each piece is linked together and the finishing touches sewed stitch by stitch. Silvia Stein Bocchese and her husband founded Maglificio Miles, a high-quality knitwear producer, in 1962. Silvia remains the president, but her four children now run the family company as a team. Maglificio Miles makes sure that designers’ ideas are finished to the highest possible standards by an expert team of artisans with wide-ranging skills. The company collaborates with some of the best names in fashion, including Azzedine Alaïa with whom it has worked for nearly 40 years. Following a designed white chalk line, a tailor carefully cuts black knitted textile fabric using a pair of sharp scissors. The scissors must be very sharp and the movement precise as the fabric cannot always be retouched. Italy Silvio Antiga Movable type printing workshop and museum The Tipoteca Italiana foundation was inaugurated in 1995 and a museum to promote and preserve the heritage of Italian typography opened its doors in 2002. The foundation also hosts educational workshops for schools, scholars and enthusiasts from around the world. Silvio Antiga opened Grafiche Antiga printing company in 1968. During the 1980s, the desire to preserve the character of early printing motivated Silvio to collect artefacts related to traditional methods of printing. Lucio Botteselle, one of Tipoteca's typographers, is printing on the "Optima" cylinder press, built by Augusta in Turin, 1914. The press comes from Tipografia Ghibaudo, based in Cuneo, it was restored at Tipoteca and is still working.